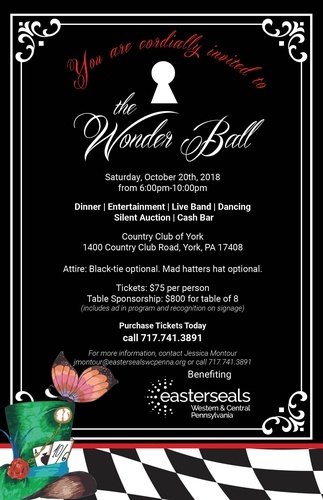 The Wonder Ball, named for our inaugural black-tie event, showcases the wonder, curiosity, and beauty of the 20,000 individuals Easterseals Western and Central Pennsylvania serves annually. This first annual event will kick off our 100th anniversary year, and benefits individuals with disabilities and other special needs, including children of currently serving and veteran military service members (with or without disabilities) in the Central Pennsylvania Region. More information can be found by visiting the Wonder Ball Website and the Wonder Ball Facebook Event.